First, a classic good-news, bad-news scenario: clingstone vs. freestone peaches. Clingstone, ususally smaller and a little bit sweeter are a pain to work with. Often you just cut slices off with a knife and leave a lot of fruit attached to the pit. Freestone are totally user friendly. Cut them in half and the pit falls right out. Ordinarily, they are larger, and perhaps a little less juicy, a tad less sweet. 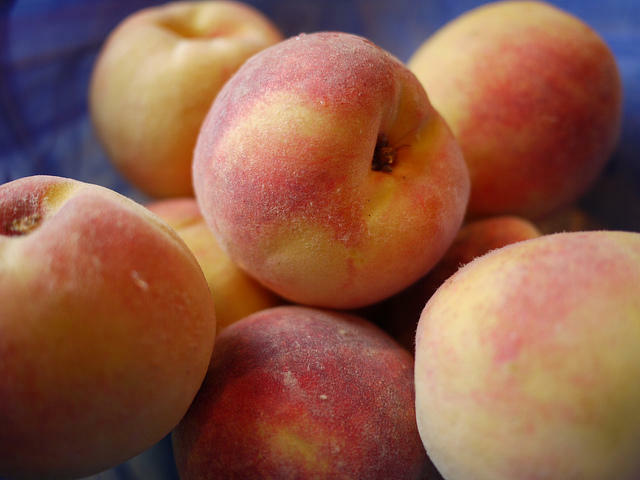 Most peaches that you buy at the markets are not quite ripe. They feel hard in your hand, and if you bite into them, they are far from juicy. The best technique we know is to lay your peaches out on a linen napkin, not touching each other, and then cover them snugly with a second napkin. Invest three or four days and then you should have a bunch of perfectly ripe and juicy peaches ready to go. Let's talk about some inventive ways to use our good Maryland peaches. Peaches and ice cream, peach pie, peach preserves are all common and tempting ideas. But let's try a few other things. Get some puff pastry and cut it into two inch squares. Lay a few thin peach slices on them, drizzle a little honey and toss on some sliced almonds. Bake and serve delicious little peach tartlets. If you chop up a peach quite finely, you can mix the peach bits into pancake batter. Save a bit of the chopped peaches as a garnish on top of the butter and maple syrup. Peaches have several interesting partners. Raspberry, Vidalia onions, jalapeno peppers and, believe it or not, avocados. You can make a refreshing salad by combining peach slices, avocado slices, mild peppers, shallots and mint. Mix up a dressing of olive oil, lemon juice and honey, and voila, a delightful summer treat. If you peel a freestone peach, and put the flesh in a processor, you can turn it into a rich purée that can be blended into a cold jug of lemonade. Perfect for poolside or on the deck at sundown. Peaches work well with savory dishes. Try frying up a batch of cut up boneless chicken thighs. Add some cut up peaches and Vidalia onions with a dollop of honey mustard and a little white wine. Season with salt and pepper and a whiff of cayene, and bingo: a tidy little one skillet meal that will go down easy. Speaking of savory, peach salsa is a classic in these parts. Combine peaches, diced red onions, chopped up yellow bell peppers, and minced parsley with a dressing of olive oil, red wine vinegar, and a touch of sugar. Your peach salsa will go beautifully with roast pork, right off the grill. You can substitute peaches for any number of other fruits. Swap peaches for apples in your favorite apple cake recipe. Instead of pineapple, use peaches for the bottom of an upside-down cake. You best blueberry muffin recipe will taste better with diced peaches added in. And a chilly sangria will take on a new dimension if you substitute peaches for apples.